I only went to the ‘Theatre of Chips’ once, it was a freezing cold January afternoon in 2006, the Seadogs were playing host to Hereford United, and the irony of course is that over the course of the next few seasons both clubs in their original guises had gone by the wayside. I should have known by that last comment that it was a wind up, I did find the pub, but it was boarded up, and looked to have been for some time. The steward had vanished by the time I made my way back to the ground, I was looking forward to thanking him for his helpfulness, so I did what you do when you go to Scarborough, I got some chips instead! I loved the Seamer Road ground, two sides of it straight out of the Seventies, while behind both goals were modern stands courtesy of the needs of the Football League. I stood on the old terrace opposite the main stand and watched Hereford come away with a 1-0 victory. Not before I’d managed a pint in the old clubhouse though, I wasn’t going to allow a steward who thinks he’s a comedian to put me off! 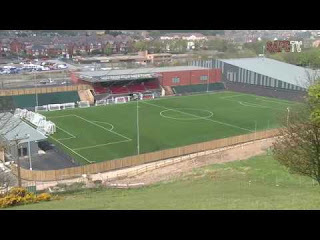 The story since is well documented, and now we are finally in a position whereby after spending many years as a newly formed club playing home games at Bridlington Town, Scarborough Athletic have finally moved back to the town, and somewhat ironically, almost right opposite the Lidl that is built on the site of the old Seamer Road. The crowds have come flooding back, so much so, the clubs first two home league games have been made all ticket, but with an F.A. Cup tie sandwiched in between, it seemed a perfect opportunity for a weekend away. With the extended Hatt family in tow having been in Scarborough since Friday tea time, we took the lazy route to the ground, a taxi from the railway station post Spoons lunch, but to be honest if it had been just me I would have walked it. 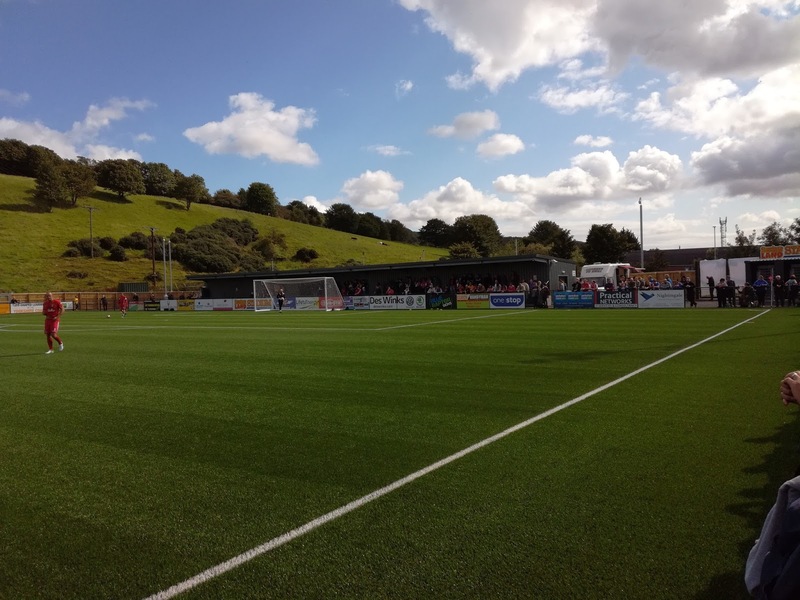 Car parking is at a premium so the club do encourage alternative means of getting to the stadium. The Flamingo Land Stadium is very different to the Theatre of Chips (it was once called the McCain Stadium! ), in fact it’s more Sweet Potato French Fries than Henry Nuttall deep fat fryer seagull bait. 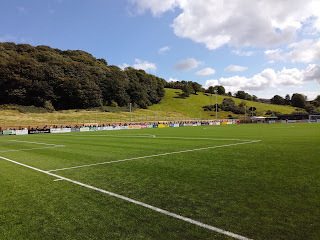 The pre-sponsored name is the Scarborough Sports Village, and it’s pretty impressive, with the stadium sitting adjacent to the modern leisure centre. 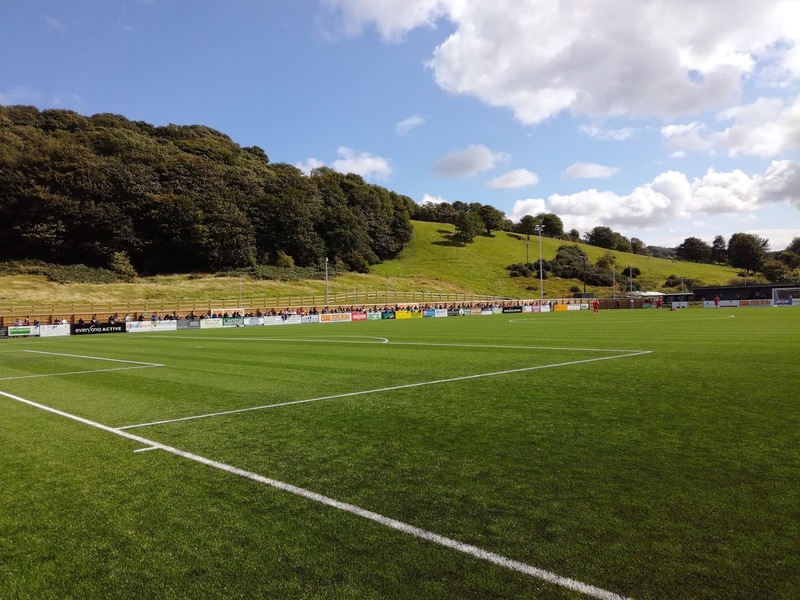 You can access the stadium from the back of the main stand but once through the foyer and into the clubhouse, the pitch sits below, in fact significantly below street level, with the ground being built into a valley. The clubhouse is a large affair but seats are at a premium, however the queueing and ordering system for the bar is both slick and quick. The stand is smart, but if you haven’t got a season ticket you ain’t getting in it. Not to worry though, there is plenty of standing room around the ground, but the only cover is behind the goal, and this is terraced, which given the size of the crowds they've been getting, it's pretty much essential. 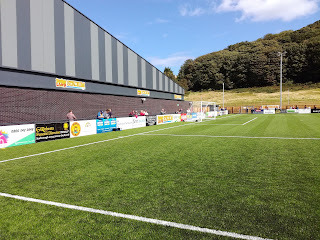 One criticism would be that the pitch side barrier is quite high, and given the fact the bulk of the perimeter is also covered in advertising hoardings, young Master Hatt even at the age of nine was struggling to see over the top. We solved that problem by standing him on the boot scraping contraption that sits by the gates that allow access to the pitch. The pitch was a 3G, or was it a 4G, I’m not sure what the difference is these days, but anyway, it’s an all-weather, multi use, lots of painted lines and crumbs of rubber facility, which to be fair, played well as the modern versions tend to do. Marske had bought a coachload of fans, and they’d clearly enjoyed their morning / lunchtime in Scarborough, it’s not actually that far, and is probably home from home with Marske actually being called Markse-by-the-Sea. But a day out in Scarborough, what’s not to like, clearly the pubs were a popular attraction? Both goals came in the first half, both from penalties, with Scarborough taking the lead and Marske then equalising. Both sides hit the woodwork once during the course of the game, the hosts with a first half header and the visitors with a free kick in the second period. Otherwise a draw was probably the fair outcome, and this demonstrates the strength of the Northern League that they weren’t overawed by the large and noisy crowd of 885, playing against one of the promotion favourites from the Evo-Stik League. Getting away at the end was easy, my mate Dave gave us a lift back to town, it was time for some chips, proper ones that seagulls like, not these fancy new ones that are orange. We decided to take a walk onto the sea front and to try and find a suitable pub / eaterie, this time we used our own judgement and a little help from Trip Advisor. I’d learnt from experience not to ask someone for advice or directions in Scarborough!